"6 months apart, 100 pound difference!" 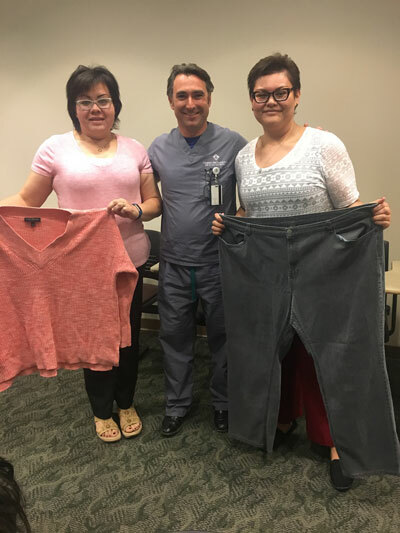 "150 lb wt loss with sleeve gastrectomy at one year." Dr. Clapp is a very professional, patient, and when you have a visit you feel that he does not rush through your appointment. In my personal case I had RNY Gastric Bypass in June 2005. After all these years, i developed a hiatal hernia and some additional intentional problems. Dr. Clapp performed my surgery and I am very pleased with the outcome. Also, the staff, Maggie the nurse is extremely kind and caring' I highly recommend this medical practice. I would highly recommend Dr. Clapp. He is caring and he has changed my life forever. My experiences with him and his staff were wonderful, and I will never forget them. Thank you Doctor Clapp for being a great doctor. A very unique and wonderful man and physician. He takes the time to explain thoroughly everything related to your medical needs. For me, he performed hernia surgery. He treated me and my family as if we were his own family. He sets the standard for quality health care. I love this man! I have found through life a lot of doctors are like math teachers, and have a hard time explaining things in simple terms for people. Dr Clapp is not like that. He explained things clearly and made sure we understood what he was saying. He also seems to enjoy his job. Which is good because I don't want a unhappy Dr cutting my husband open. My husband had a hernia the size of Texas fixed. His staff is nice and does what they say they are going to do.They call back quickly, they too explain what to except and what to do each step of the way. Also It really seemed the hospital staff liked and respected him. Which aren't they the ones that really know? .Surgery no matter how small is scary and he made it less scary. Thank you Dr Clapp and Staff. Thank you for your courtesy and professionalism!! !